TNT has set out to build the strongest adjustable trackbar system for the Jeep® Cherokee XJ, MJ Comanche and ZJ Grand Cherokee. Our overkill design ensures that our Trackbar solution will withstand any abuse you throw at it and come back for more. 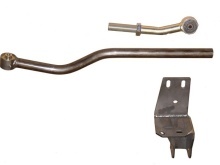 This Trackbar System is made for the factory steering configuration if you've upgraded to our Over The Knuckle Steering System you will need to purchase an OTK Trackbar end from us. Both our drop trackbar bracket and our trackbar have withstood the test of time on trails all around the world. To date we've not had a single bracket or trackbar failure. That's a record we're proud of! *Trackbar and trackbar mount ship powdercoated hammered gray.